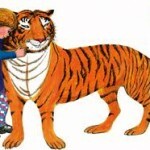 The Tiger Who Came to Tea is one of the best-selling picture books of all time. Since it was first published in 1968, it has sold over 4 million copies worldwide and is translated in over 20 different languages. And now, this much-loved tale has been adapted for the stage with songs and lyrics by David Wood OBE; the country’s leading writer and director of plays and musicals for children. His many successes include Goodnight Mr Tom, Shaun The Sheep, George’s Marvellous Medicine, Fantastic Mr Fox, The Gingerbread Man, BFG, The Witches, Meg and Mog, Spot and Babe the Sheep Pig. The show is the ideal introduction to theatre for pre and primary school children and their families. Featuring magic and sing-along songs, The Tiger Who Came to Tea is perfect for developing literacy and listening skills, and audience participation is highly encouraged!